Offering a couple of NOS Pro Am 3/8-24 to SO-239 mounts. -- Pro Am Gum Drop Roof or Flat Surface Mount 3/8-24 to SO-239 for $12.95 plus $5 shipping. 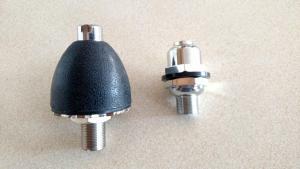 -- Pro Am P106AD Extra Heavy 3/8-24 to SO-239 Mount for $8 plus $5 shipping.